The Jungle Book 1967 27x41 Orig Movie Poster FFF-16899 Fine, Very Fine Disney. The Jungle Book Authentic Original Movie Poster: U. This listing is 100% guaranteed for The Jungle Book as an original movie poster issued either directly from the film studio or an authorized distributor. Size: 41 in x 27 in. Some fold wear, slight fold separation, some wrinkling throughout, small tear right upper border, single-sided. This poster is considered to be within that class and is definitely INVESTMENT QUALITY. Movie Starring: Bruce Reitherman, George Sanders, Phil Harris, Sebastian Cabot. Genre: Adventure, Animation, Disney, Family. This movie poster was designed to publicize the films release by hanging at a theater or Cineplex. We do not sell reprints or reproductions of any kind. We do not use any stock images. Customer Service & Satisfaction Comes First. Is a poster that has never been used or displayed. May show extremely minor signs of age. Folded posters may show very minimal wear at the folds due to storage. The posters should have no holes, no tears and no paper loss. Is a poster that appears fresh and lightly used, with saturated colors. Folded posters may show very minimal wear at the folds. Is a poster with bright color and a clean overall appearance. It may have one or more general signs of use such as slight fold separation, fold wear, pin holes, or very minor tears. Is a poster with good color and a very presentable overall appearance. It may have tears, slight paper loss, pin holes, minor stains and some fold separation. Is a poster with either bright or only slightly faded color and presentable overall appearance. It may have some paper loss, staining, writing in unobtrusive places, tears, pin holes, fold separation and tape supporting the back of the poster. Is an average poster showing general signs of age wear, which may have some color fading, paper loss, staining, writing, tears, pin holes, fold separation, tape, tape stains, signs of aged paper and need restoration. Is a below average poster showing significant signs of use and age, which may have some color fading, paper loss, staining, writing, tears, pin holes, fold separation, tape, tape stains, signs of aged paper and definitely needing significant restoration. Is a poster that is in dire need of restoration. As a LAMP-approved dealer, our guarantee is that we have provided accurate descriptions and grades for our original movie posters. We actively subscribe to LAMPs non-misrepresentation agreement and have pledged to provide accurate and factual descriptions of all the items we offer for sale. We are certain you will be delighted with your posters. At no charge to you, we will provide a Certificate of Authenticity that guarantees our products to be original. To protect everyone, we insure all items for the FULL AMOUNT. Even though we take every precaution to make sure your poster arrives unscathed, accidents happen! All posters are insured through the U. To protect everyone, we insure all items for the full amount. Are you looking to sell an original vintage movie poster collection dated pre-1990s? Disney animation inspired by Rudyard Kiplings "Mowgli" story. Mowgli is a boy who has been raised by wolves in the Indian jungle. When the wolves hear that the fierce tiger, Shere Kahn, is nearby, they decide to send Mowgli to a local "man tribe". 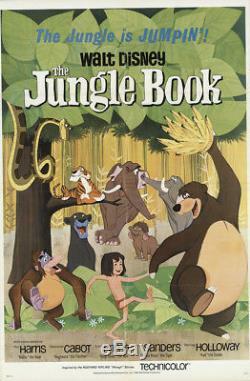 On his way to the village, Mowgli meets many animal characters in this musical tale. When Shere Kahn learns of Mowgli's presence, he tracks him down. The item "The Jungle Book 1967 27x41 Orig Movie Poster FFF-16899 Fine, Very Fine Disney" is in sale since Thursday, November 23, 2017. This item is in the category "Entertainment Memorabilia\Movie Memorabilia\Posters\Originals-United States\1960-69". The seller is "fffmovieposters" and is located in Scottsdale, Arizona. This item can be shipped worldwide.